PROS is sad to say the County line is now closed down! Ron and the team conducted an investigation on 10-04-08 . We used our DVR system and the new members experienced some of the same reported experiences other investigators have documented from past investigations. This information was not shared with the new members. The team conducted a follow up investigation on 7-24-09. Once again the past experiences were not shared with any new members or visitors. Once again the place lived up to it's expectations! Some EVP was captured and is posted below. In the image below a very strange anomaly occurs. Please note the orb on the girl's back in the forefront of this photo actually conforms to the girl's body. This is very conclusive evidence that all orbs are NOT dust or, could it be light refractions? most likely an artifact created by the shiney vent hose seen behind the artifact. She did say she felt a cold spot there. This photo came to us courtesy of our friends at COPS [Central Oklahoma Paranormal Studies] Thanks guys -- good catch! One report [we have found no official documentation of this event] is the story of a man who was shot and died at the County Line which was then called the Kentucky Club. The murder allegedly happened by the fireplace many years ago. 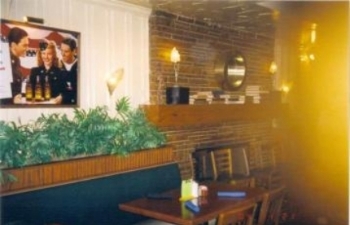 It is said that the murdered man's ghost still haunts the place; reportedly his name was Russell. This is the name that PROS captured in an EVP [Electronic Voice Phenomenon] in which a male voice says "Russell" when we asked for a name! Another EVP was captured where a person is heard having labored breathing. A male voice is then heard to say "Why am I swaying" then a voice says "Bullets." You will also hear a whistle sound which followed Logan for several months. Therin is heard saying something about how "Curiosity killed the cat." Oscar is also heard telling the team about the murder that is said to have happened. So if you want the best BBQ in town and a top-notch wait staff, go to the County Line. If you happen to see something strange, remember it might not be your imagination at work. It could be some of those former guests from many years past who seem to linger. About 7 seconds go by and you hear a man's voice reply "Russell" at a low volume. The next question is "What can we do to help?" "Stay out" is then heard at a low volume. You will also hear "Miss it." One point of interest is the fact you will hear several team members talking a bout a sound they heard. The sound was a whistle sounding noise. This sound was heard at several different investigations and was not a phone or other piece of equipment. This sound was first recodered on investigation in Shawnee Oklahoma. From that time on the noise was witnessed by many different people at other locations when Logan from the OKCGC was present. This seeemed to be a case a of someone being haunted, not a place. However, the noise seemed to be linked to Logan's emotions. In times of great excitment the sound was heard. When the noise was heard the team would investigate the area only to turn up empty-handed in our search. Cold spots were felt during these episodes as well. We were unable to establish the cause of the strange sound, once again it seemed associated with Logan. This sound follwed him for a six month period and occured at what seemed random times. The County Line BBQ in Oklahoma City is a case that allegedly involves a tragic end of a life we are told. 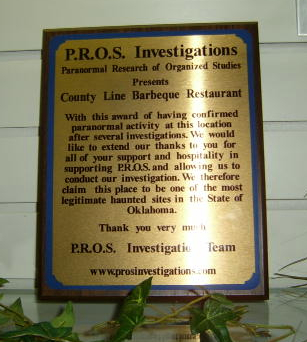 After several investigations, PROS has concluded that the County Line has paranormal activity. What kind of activity? Several persons from the PROS Team have seen apparitions in the basement. We have also had responses back from our knock tests. PROS has gathered numerous EVP's there. PROS presented the County Line with a plaque, located in a case on the wall, on the left side as you walk in, declaring the place haunted. This is a picture that the PROS team took by the fireplace. It seems to have the faint image of a man. The camera was digital. Russell was said to have died in that area. We also have several other pictures with the strange flare seen in this picture but taken with different cameras. Most likely cause is lens flare caused by a refelctive surface. If it can be reproduced it's an artifact and not paranormal. This EVP was captured on 7-24-09. You will hear Ron asking for a beer. A male voice is then heard saying, "That will be a buck." Tim then says something about hearing a noise.